The foodborne pathogen Bacillus cereus can cause diarrhoeal food poisoning by production of enterotoxins in the small intestine. The prerequisite for diarrhoeal disease is thus survival during gastrointestinal passage. Vegetative cells of 3 different B. cereus strains were cultivated in a real composite food matrix, lasagne verde, and their survival during subsequent simulation of gastrointestinal passage was assessed using in vitro experiments simulating transit through the human upper gastrointestinal tract (from mouth to small intestine). No survival of vegetative cells was observed, despite the high inoculum levels of 7.0 to 8.0 log CFU/g and the presence of various potentially protective food components. Significant fractions (approx. 10% of the consumed inoculum) of B. cereus vegetative cells survived gastric passage, but they were subsequently inactivated by bile exposure in weakly acidic intestinal medium (pH 5.0). In contrast, the low numbers of spores present (up to 4.0 log spores/g) showed excellent survival and remained viable spores throughout the gastrointestinal passage simulation. Vegetative cells are inactivated by gastric acid and bile during gastrointestinal passage, while spores are resistant and survive. Therefore, the physiological form (vegetative cells or spores) of the B. cereus consumed determines the subsequent gastrointestinal survival and thus the infective dose, which is expected to be much lower for spores than vegetative cells. No significant differences in gastrointestinal survival ability was found among the different strains. However, considerable strain variability was observed in sporulation tendency during growth in laboratory medium and food, which has important implications for the gastrointestinal survival potential of the different B. cereus strains. B. cereus can cause emetic and diarrhoeal and food poisoning by production of resp. emetic (cereulide) and diarrhoeal toxins (non-haemolytic enterotoxin (Nhe), haemolysin BL (Hbl), cytotoxin K (CytK), etc.) . In contrast to the extremely stable toxin cereulide, the enterotoxins are easily degraded by acid and digestive enzymes (proteases) and thus preformed enterotoxins in food do not retain their toxicity during gastrointestinal passage . Therefore, the prerequisite for diarrhoeal food poisoning is enterotoxin production by B. cereus in the small intestine, so the gastrointestinal survival of vegetative B. cereus was investigated. It was previously shown that approx. 10% of the vegetative cells survived gastric passage . Next, the surviving bacteria are confronted with bile in the lumen of the duodenum, the proximal part of the small intestine. Bile mainly consists of bile acids (approximately 72% of the total lipids), besides phospholipids (approx. 24%) and cholesterol (approx. 4%) . In humans, these bile acids consist mainly of cholic acid (between 50% and 80%) and chenodeoxycholic acid (between 20% and 50%) [5, 6]. They are synthesized in the liver from cholesterol and conjugated to glycine (approx. 75%) or taurine (approx. 25%), with conjugation ratios depending on the diet amongst other factors [6, 7]. Secretion of bile is triggered by fat and acid release from the stomach into the duodenum, which results in 7 to 15 mM bile salts in the small intestine after a meal, corresponding with 5 to 10 g Oxgall/L [7–10]. Deconjugation of bile acids by indigenous intestinal bacteria mainly occurs in the distal ileum, where approx. 95% of the bile acids is reabsorbed, of which approx. 15% is unconjugated [7, 10]. Both conjugated and unconjugated bile acids are absorbed by passive diffusion along the entire gut, but this process is more efficient for unconjugated bile acids. Additionally, specific active transport systems are present in the distal ileum, which are more efficient in the uptake of conjugated bile acids. After absorption from the intestine, the bile acids are transported to the liver via the blood, reconjugated and secreted again into the bile bladder. This recycling process of bile acids is called enterohepatic circulation. The physiological role of bile acids is to increase the solubility of dietary fat and facilitate its degradation and absorption. Due to their detergent properties, bile acids also alter cell membranes and thus have cytotoxic and bactericidal effects, noticeable by an increased membrane fluidity and permeability [11–14]. Depending on the bile concentration, disruption of the cell membrane integrity occurs nearly instantaneously, causing cell leakage and death, or more slowly and subtly by altering the membrane permeability and fluidity, the activity of critical proteins in the cell membrane and the membrane hydrophobicity . In addition to destruction of the bacterial cell membrane integrity, bile also induces DNA damage, denaturation and misfolding of proteins, leading to the death of bacteria . Gram-positive bacteria tend to be more sensitive to bile than Gram-negative bacteria, but bile tolerance is very strain specific, so generalized statements for species are not possible [17–19]. Despite the bactericidal effects of bile, some micro-organisms have developed bile resistance by induction of bile metabolizing enzymes and transport systems or by altering membrane permeability, fluidity or charge. Some enteric pathogens may even depend on bile as a host signal for virulence regulation. For example, Salmonella enterica serovar Typhimurium possesses the multidrug efflux pump AcrAB for bile removal and transport through the outer membrane . Moreover, invasion of the host’s epithelial cells by this bacterium is induced by lowered bile concentrations, so after transit to the distal ileum or into the mucus layer . The co-ingestion of food is an important factor in the antibacterial activity of bile in the intestines. Bile inactivation of bacteria is influenced by the presence of food components, which can create protective micro-environments or bind bile. For example, the maximum bile concentration tolerated by B. cereus during growth in intestinal medium was 3 g/L porcine bile when pea soup was supplemented, while only 0.9 g/L and 0.6 g/L bile were tolerated in the presence of milk and the absence of food, respectively . Also for Lactobacillus curvatus, the presence of a food matrix, namely meat, increased its bile tolerance and subsequently its gastrointestinal survival . Similarly, the bile tolerance of Bifidobacterium breve was enhanced by soy proteins . In this study, the gastrointestinal survival of vegetative B. cereus cells was investigated and linked to the bactericidal role of bile. The B. cereus inoculum was cultivated in the composite food matrix lasagne verde prior to the in vitro simulation of the gastrointestinal passage to include any potential protective effects of the food particles on the gastrointestinal survival of B. cereus. The B. cereus strains ATCC 14579, NVH 1230–88 and FF 73 (Table 1) were cultivated and subsequently subcultured in 10 mL Tryptone Soya Broth (TSB, Oxoid) for 24 h at 30°C. After centrifugation and resuspension in 1 mL Physiological Peptone Salt solution (PPS, 8.5 g/L NaCl (Fluka) and 1 g/L neutralized bacteriological peptone (Oxoid)), 830 μL of the subculture was inoculated on 83 g lasagne verde (purchased in the local supermarket) in stomacher bags and incubated for 24 h at 22°C. Retail lasagne verde was purchased in the local supermarket, which contained on average 4.7 log CFU/g total bacteria (standard deviation of 1.3 log CFU/g, analysis of 11 different products during a 6 month period) and ≤ 2.0 log CFU/g B. cereus. The average pH of this food product was 5.52 (standard deviation ± 0.06). 1ATCC = American Type Culture Collection, USA; 2NVH = Norwegian School of Veterinary Science, Oslo, Norway; 3FF = Flanders’ Food Collection, Belgium. The total count and B. cereus count were determined by plating the appropriate dilutions in PPS on Tryptone Soya Agar (TSA) and Mannitol-Egg yolk-Polymyxin B agar (MYP, respectively. Spore concentrations were determined by plating after heating at 80°C for 10 min. The dynamic gastrointestinal simulation experiment comprised five phases: 1) the mouth, 2) the stomach, 3) the duodenum, 4) dialysis and 5) the ileum . Briefly, the lasagne verde containing the B. cereus inoculum (83 g) was mixed with saliva medium (56 mL, pH 6.5, 37°C) by stomaching for 1 min (Stomacher Lab Blender 400, Seward) and incubated for 10 min before transfer to the stomach vessel. The gastric pH was decreased from 5.0 to 3.0 during the first 90 min and to 2.0 during the last 90 min by continuously added acid (0.28 M HCl). Gastric emptying was initiated 30 min after the start of the gastric phase in 5 fractions by discontinuous pumping in such a way that approx. 25% of the gastric content was removed after 1 h, 50% after 2 h and 75% after 3 h. The fractional gastric emptying resulted in a 150 min overlap between the stomach and duodenum phase, in which the B. cereus inoculum was divided in subpopulations which were subjected to various different incubation times in the stomach phase (min. 30 min, max. 180 min) and duodenum phase (min. 10 min, max. 160 min). The intestinal vessel was anaerobic (flushed with nitrogen gas) and contained intestinal medium with 10.0 g/l bile (Oxgall, Difco) and the pH pH was automatically adjusted by a pH controller (FerMac 260, Electrolab) to remain at pH 5.0 during the first 45 min and at pH 6.0 during the last 115 min. And the end of the duodenum phase, the complete gastric contents were transfered and the bile concentration was lowered by dilution to 5 g/L. During the next phase, ≥ 90% of this bile was removed by dialysis and competition with human intestinal bacteria was simulated during the final ileum phase. However, after elimination of the B. cereus vegetative cells, the gastrointestinal experiment was stopped, resulting in experiments consisting of the first three phases only. The experiments were performed in triplicate with different B. cereus inocula on different days. B. cereus strain NVH 1230–88 was cultivated and subsequently subcultured in 10 mL TSB for 24 h at 30°C. Then 100 μL of the subculture was inoculated in glass tubes containing 9.9 mL TSB and incubated at 37°C. The pH of the TSB was either neutral (pH = 7.2) or acidic (pH = 5.0) and supplemented with varying bile concentrations, resulting in the final concentrations of 0.0 (TSB control), 1.0, 5.0 and 10.0 g/L oxgall (Difco). The survival of vegetative B. cereus cells was assessed by plating the appropriate diltutions in PPS on TSA. Production of enterotoxins Nhe and Hbl was determined by analyzing 1 mL samples after filtration (0,2 μm syringe filters, Whatman) with the Duopath® Cereus Enterotoxins (Merck) according to the manufacturers’ instructions. The lasagne verde was inoculated with approx. 6.0 CFU/g B. cereus and incubated for 24 h at 22°C to obtain a highly concentrated inoculum of vegetative B. cereus cells grown in a composite food matrix with food microbiota by simulating storage of contaminated lasagne at room temperature. This resulted in lasagne verde containing approx. 8.5 log CFU/g total bacteria, of which B. cereus constituted 7.0 to 8.0 CFU/g, depending on the strain (Table 2). B. cereus NVH 1230–88 showed a stable spore concentration of 3.5 log spores/g, originating from the TSB inoculum. In contrast, additional sporulation was apparent from approx. 4.0 log spores/g to 4.5 log spores/g after 30 h for B. cereus FF 73. Remarkably, B. cereus ATCC 14579 did not produce any spores after 30 h incubation, with only very low numbers (3.0 spores/g) observed in only 1 of the 3 replicate bags. After inoculation and incubation, the lasagne verde was thus highly contaminated with B. cereus vegetative cells (7.0 to 8.0 log CFU/g) in the stationary growth phase and low amounts of B. cereus spores (up to 4.0 log spores/g). No production of enterotoxins was detected in lasagne verde after 24 h by B. cereus ATCC 14579 and B. cereus NVH 1230–88, while Nhe was sporadically detected (in 1 out of 3 replicates) in the case of B. cereus FF 73. This was probably due to the acidic pH 5.5 of lasagne verde and the rather low incubation temperature of 22°C, which are not optimal for enterotoxin production . However, preformed enterotoxins in food are not responsible for the diarrhoeal food poisoning, since they are rapidly degraded during gastrointestinal passage . The lasagne verde contaminated with 7.0 to 8.0 log CFU/mL B. cereus vegetative cells in the stationary growth phase was subjected to in vitro simulation of gastrointestinal passage (Figure 1). Survival of B. cereus (< 1 log reduction) was observed during the mouth phase and the first 30 min of the stomach phase when the gastric pH was between 5.0 and 4.0. Thereafter, when the gastric pH decreased below 4.0, the vegetative cells were rapidly inactivated in the stomach phase, noticeable as a rapid decline of the total B. cereus counts to similar values of the B. cereus spore counts in the gastric vessels. The B. cereus total and spore counts during the duodenum phase remained approx. 1.0 log CFU/mL for B. cereus ATCC 14579, approx. 2.5 log CFU/mL for B. cereus NVH 1230–88 and approx. 3.5 log CFU/mL for B. cereus FF 73. Interestingly, the spore counts of B. cereus NVH 1230–88 decreased during the stomach phase during the last hour and most acidic pH. Since the total B. cereus count did not change, this indicates initiation of spore germination. B. cereus ATCC 14579 showed inconsistent spore production, resulting in the absence of spores during the first two simulations and very low numbers (slightly above the detection limit of 1.0 spores/mL) during the last two experiments. Inactivation of vegetative cells during the dynamic in vitro simulation of gastrointestinal passage with B. cereus ATCC 14579 (1), B. cereus NVH 1230–88 (2) and B. cereus FF 73 (3); the B. cereus total (a) and spore (b) counts were determined by plating on MYP without and with heat treatment (10 min at 80°C), respectively, in the lasagne verde (□), the mouth phase (◊), the stomach phase (Δ) and the duodenum phase (○); the average values and standard deviation of triplicate experiments on different days are presented. No detection tests for enterotoxins Nhe and Hbl were performed, since no growth was observed during any of the gastrointestinal phases, which is a prerequisite for enterotoxin production . The growth and survival of B. cereus NVH 1230–88 was determined in the presence of varying bile concentrations (Figure 2). At optimal conditions, i.e. neutral TSB with pH 7.2, the effect of bile was concentration dependent. The lowest concentration of 1.0 g/L Oxgall resulted in a population reduction of approx. 30% in comparison with the control (TSB without bile) at time 0 h. Moreover, after 1 h the viable count was reduced with approx. 40% in comparison with the concentration in TSB with 1.0 g/L Oxgall at 0 h. However, after 2 h recovery and outgrowth of the remaining cells was observed, because the B. cereus concentration was similar to that of 0 h, and finally after 3 h, the population had increased with approx. 1 log in comparison with that at 0 h. However, the presence of 5.0 g/L Oxgall induced a permanent decline to 4.1 log CFU/mL on average (inactivation of 88% of the vegetative cells) and that of 10.0 g/L Oxgall to 3.9 log CFU/mL (inactivation of 94%). 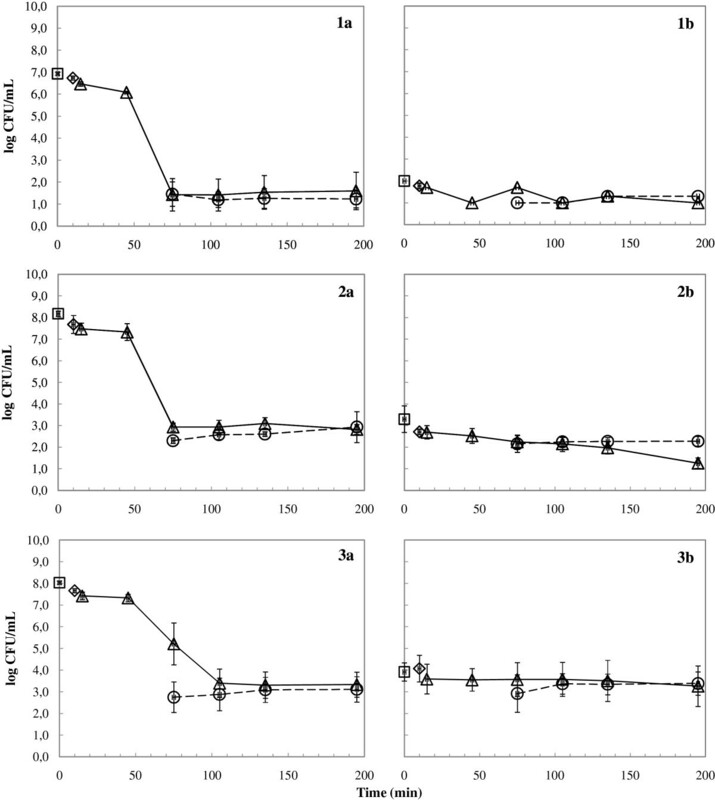 Survival of B. cereus NVH 1230–88 in Tryptone Soya Broth (TSB) at 37°C with pH 7.2 (A) and pH 5.0 (B) with varying bile (Oxgall, Difco) concentrations: 0.0 g/L (white), 1.0 g/L (light grey), 5.0 g/L (dark grey) and 10.0 g/L (black). In TSB at acidic pH 5.0, approx. 99% of the B. cereus inoculum was instantly inactivated by the bile exposure, regardless of the bile concentration, resulting in constant total B. cereus counts of approx. 3.0 log CFU/mL. The B. cereus inoculum contained between 0.1 and 0.2% spores, so constant spore counts were obtained throughout the experiment: 2.6 (± 0.2) log spores/mL at the beginning and 2.5 (± 0.3) log spores/mL at the end. Taking this spore population into account, the vegetative cells still constituted the majority (approx. 60%) of the 1% bile resistant B. cereus. The survival of vegetative cells during gastric passage was similar to that of previous studies with mashed potato medium . During those experiments, approx. 10% of the vegetative cells survived gastric passage, most of them in the first gastric fraction when gastric pH was between 5.0 and 4.0. These cells were transferred alive into the intestinal vessel and thus between 5.5 and 6.5 log CFU/mL B. cereus were expected in the intestinal vessel. However, much lower counts, which approximated the B. cereus spore counts, were obtained during the duodenum phase. This indicates that the vegetative cells which survived gastric passage were inactivated in the intestinal environment. Batch incubation experiments in TSB and varying concentrations of bile showed that the majority (99.1%) of vegetative cells was inactivated immediately after bile exposure at pH 5.0, regardless of the bile concentration in the range of 1.0 to 10.0 g Oxgall/L. In conclusion, vegetative B. cereus cells which survived gastric passage were eliminated during the subsequent duodenum phase by the bactericidal effect of bile. The bactericidal effect of bile on vegetative B. cereus cells was pH dependent. At pH 7.0, the inactivation was correlated with the bile concentration, and the lowest bile concentration (1 g/L) even allowed survival and growth. In contrast, at pH 5.0, instant inactivation of the majority (> 99%) of vegetative cells occurred, independent of the bile concentration (in the range of 1.0 to 10.0 g/L). Similar to our results, inactivation of Listeria monocytogenes by bile acids was also strongly increased at acidic pH 5.5 . Inactivation of bacteria by bile is similar to that by organic acids, which are both particularly effective at low pH. The logarithmic acid dissociation constant (pKa) of unconjugated bile acids is approximately 5.1, but conjugation with glycine lowers the pKa to approx. 3.7 . Conjugation with taurine leads to an even lower pKa of approx. 1.5 . As a consequence, the majority of conjugated bile acids is dissociated and ionized at most physiological and intestinal pH values, namely 95.24% at pH 5.0 and 99.95% at pH 7.0 for glycoconjugated bile acids. Only the unionized forms of bile acids can passively cross the cell membrane, while the dissociated and ionized conjugated bile acids require specific active transport systems . As a result, 4.67% of the conjugated bile acids can enter the B. cereus cells at pH 5.0, in contrast to only 0.03% at pH 7.0. Moreover, the internal pH of viable B. cereus cells always lies between 6.0 and 7.5, depending on the external pH and culture conditions . After the undissociated bile acids have diffused into the B. cereus cells, the majority of them (99.50 to 99.98%) undergoes intracellular dissociation, resulting in lethal internal acidification. It was reported that certain food components increased the bile tolerance of B. cereus vegetative cells in intestinal medium with pH 6.5 . However, the composite food matrix lasagne verde did not mitigate the detrimental effects of bile on B. cereus during our experiments at pH 5.0. It is possible that food type effects are only observed at a more optimal pH for this foodborne pathogen, when more pronounced differences between treatments are expected. In contrast to vegetative cells, B. cereus spores were not inactivated by bile, although they did not germinate in the intestinal medium containing 5 to 10 g/L Oxgall. This coincides with the observations of the dynamic simulation of gastrointestinal passage of spores , where spores were unaffected during the mouth, stomach and duodenum phase and only started germination during the dialysis, when the bile concentration was lowered from 5.0 g/L Oxgall to < 0.5 g/L and those of the batch incubation experiments , where spores germinated within 2 h in intestinal simulation medium containing 1.0 g/L bile. Other studies also reported that spores were able to germinate and multiply in simulated intestinal fluid containing bile (1.5 g Oxgall/L)  and that the bile resistance of B. cereus spores was superior to that of vegetative cells . In conclusion, high bile concentrations (≥ 5 g/L Oxgall) do not allow spore germination, while low bile concentrations (< 5 g/L) induce germination and outgrowth. Besides its importance in nutrient digestion and absorption, bile is also an important antimicrobial compound in the intestine . Abnormal low intestinal bile levels may occur in people with biliary or liver abnormalities or with deficiencies in the enterohepatic circulation, which may render those people especially susceptible to diarrhoea because of enhanced survival of ingested and intestinal bacteria. Moreover, bile acids are endogenous laxatives, so malabsorption of bile acids from the small intestine, leading to increase bile levels in the terminal small intestine and the colon, may also result in diarrhoea . B. cereus vegetative cells were unable to survive gastrointestinal passage as simulated by the in vitro experiment, despite the high inoculum concentration of 7.0 to 8.0 log CFU/mL and the cultivation of the inoculum in the composite food matrix lasagne verde. The majority of vegetative cells was inactivated by gastric acid, and the surviving cells were subsequently inactivated by bile during the duodenum phase. In contrast, B. cereus spores survived the simulation of gastrointestinal passage and remained spores during unfavourable conditions for germination (and outgrowth). Therefore, the infective dose for B. cereus probably varies according to the physiological form consumed, being lower for the highly resistant spores. Although the gastrointestinal survival was similar for the different strains, their sporulation tendency varied considerably, which in turn has important implications for the gastrointestinal survival potential and thus the infective dose of the different B. cereus strains. We, all authors, declare that we have no competing interests. SC, MU and TVdW designed the experiments; SC and SH performed the experimental work and processed the results; SC wrote the manuscript aided by MU, NB and TVdW. All authors read and approved the final manuscript.